1. Take a wine cork. 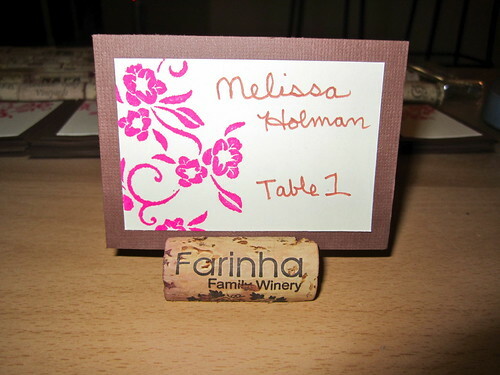 Decide how you would like it to sit on the table (being able to read the winery name or not). Grab a razor blade or X-acto knife. 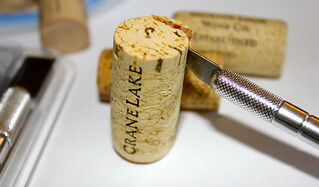 Slice off a thin strip along the cork to create a flat edge that will sit on the table to keep the cork from rolling. 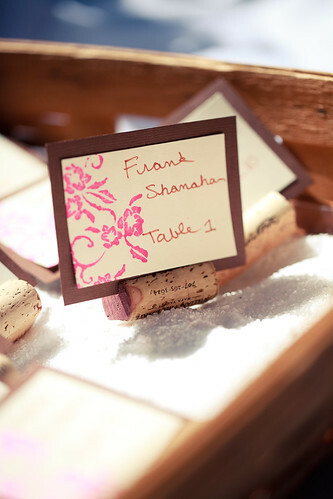 Now take your knife and and cut a slit along the top side length of the cork to create a channel for the card to slip into. Repeat for each cork. I made 100 of these by hand and it was quite a beast. I did about 20 per night for a week and my hand was super tired and cramped by the end of the week. 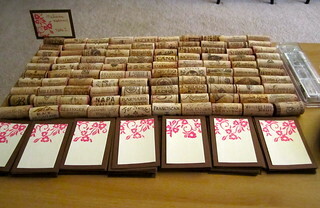 I kept a bunch of them after the wedding to use for a wine party or to hold appetizer signs at a cocktail party to make sure all that hand work will not go to waste. 2. Now on to the easier part. Decide on the size for your cards. I wanted mine to be 3.5″ by 2.5″. I started with brown paper, cutting out 100 squares. 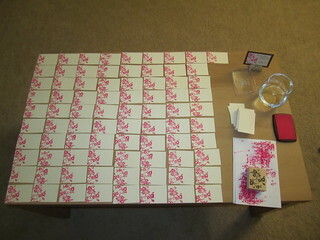 Next I cut 100 cream color squares approximately 3″ by 2″. 4. 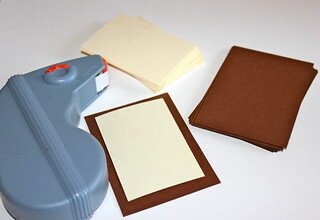 Once the pink ink is dry, glue the cream cards onto the brown cards, and the only thing left to do is write each guests information on the cards. This whole project was a bit more time consuming than I expected, but overall it went along great with the rustic theme and tied in to our wine bar. Here is the final product, displayed at the wedding in a rustic, crate box with Epsom salt to help hold them up to any wind. Photo by our amazing photographer Shepard Photography.